Supports a healthy immune system! Helps support bloating, gas and indigestion! and support your health digestion! Feel Better and Better Every Day! Suffering? Your stomach is too alkaline! Many people don't realize that occasional acid reflux, heartburn and other digestive problems are actually caused by having an alkaline stomach. Naturally supports your body's production of stomach acid and helps you digest your food more fully. NOT your ordinary apple cider vinegar. It's a concentrated apple cider vinegar in powder form PLUS a powerfull but natural stomach acidifier called Betaine Hydrochloride. 30 day (1 month) supply. That’s only 22 cents per meal. If you get autoship (monthly shipped), it’s only 16 cents per capsule. This stuff works! My mom is 87 and has suffered with acid reflux for about 5 years. She was given anti acid meds from her doctor and she still suffered. I never liked her taking those meds, so when I learned about what apple cider vinegar can do for acid reflux (from a Dr. Berg video on YouTube "The Importance of Hydrochloric Acid (HCL)",[...] , I had my mom get off the meds and start using the vinegar mixed in water. 1) Anti acid meds do just that, decreased acid production. Your stomach needs acid, a low acid level causes acid reflux, yes LOW ACID = ACID REFLUX! Please watch this vid, Dr. Berg does a great job explaining how your stomach works! So undoing what these meds have done will take a little while, it doesn't happen overnight. 2) She wasn't good about drinking the vinegar water before each meal, so she would complain that it wasn't working. By now, 3-4 months have passed. So I asked my mom if she would be willing to take the capsule form of the apple cider vinegar and she agreed that it would be easier. So I purchased one bottle of the Apple Cider Vinegar Plus from Amazon and gave it to my mom. Three weeks later, I remembered to ask my mom how she was doing, and I couldn't believe what she said...she said that the acid reflux was almost gone, she occasionally would have acid reflux, she said this stuff really works! She was doing better after one week on it! She was also running out of the capsules, so I happily told her that I would get her more! 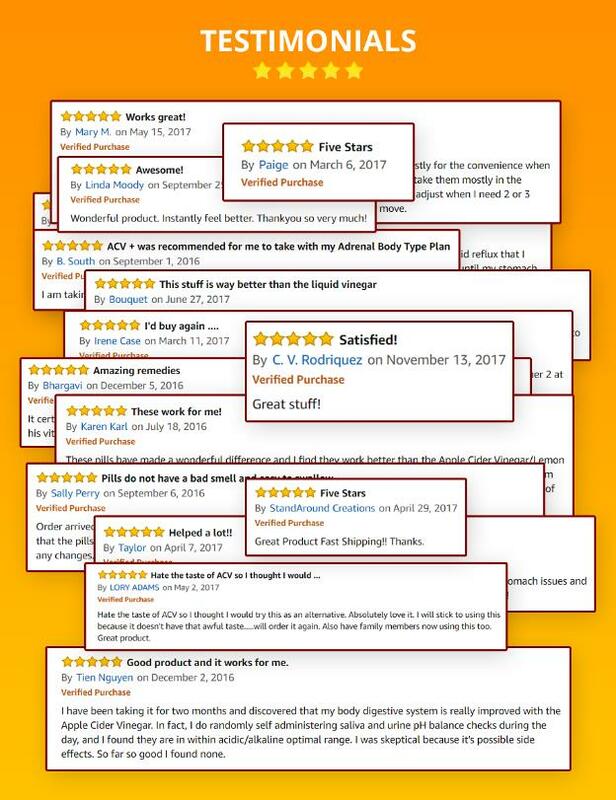 When I went back to Amazon, they were totally out of the product and didn't know when they would get it back in stock. I then went on Dr Berg's website to buy it direct and they too were out of it too. Now I'm getting desperate to get this stuff, so I called Dr. Berg's office to ask when it would be back in stock. The woman I spoke to, took my number and said she would get back to me in a little while. True to her word, she called me back within an hour! She told me that the product was in house and that someone had forgot to update the website. She said that they just updated their website and I could now purchase the product! I was so impressed!!! Now that's what I call EXCELLANT CUSTOMER SERVICE!!! I immediately ordered two bottles from Dr. Berg and received them quickly! My mom is doing so well and she is so thankful to Dr. Berg for creating a natural product that the elderly can take very easily, and that TOTALLY WORKS! I just ordered more for both of us. Occasionally I get acid reflux, so I'm going to be proactive and incorporate this into my regiment. If you have occasional heartburn or acid reflux, you've probably been told the best solution is antacids. And when you take them, you do feel better for a little while. But then the problem comes back, sometimes worse than ever. Why? Because the real reason you're having problems is because your stomach is too alkaline. This can happen due to aging and diet. 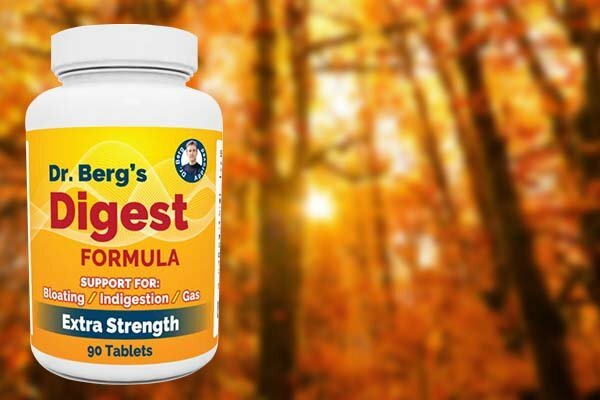 Digest formula uses Dr. Berg's natural approach to support healthy digestion. Taken before meals, this remedy will support your normal pH. Then you can enjoy healthy digestion. And feel better every day! Supports your stomach and digestive tract. Relieves occasional heartburn, reflux and bloating. Promotes a healthy stomach pH - which should be between 1 and 3. Includes Betaine Hydrochloride, a natural mineral that comes from beets, a powerful stomach acidifier. Indirectly helps release bile from liver for better digestion. Boost immunity indirectly by promoting your healthy digestion. This issue with indigestion became more pronounced with every passing year. FINALLY I started researching how to deal with indigestion as an issue in aging. As we age, all of our bodily processes slow down. This includes digestion. Apple cider vinegar helps our stomach's pH balance. Betaine helps to digest foodstuffs that we previously had no problem with. Ox Bile allows us to digest fats that previously were no trouble at all. So I sip on water with ACV all day long, when I'm home. I take a betaine capsule before I eat a meal. I take 125 mg ox bile if my meal has much fat in it. BUT what if I'm gone all day? What i I want to meet a friend for lunch or dinner while I'm out all day? What if I run out of ACV at home and just can't get to the grocery store any time soon? That's where these little capsules save the day. I keep a few of these capsules in an old Mentos container in my purse. I also keep an old Mentos container full of these in my travel kit. They work. They work just as effectively as ACV in water. And they have the betaine with them, so I don't have to carry a separate capsule. As we age, our stomach acid diminishes thus creating a cascade of negative health events. In addition to the aging process, other things can also influence your stomach acids: anti-acids, low salt diets, excess sugar and excess calcium. This product contains apple cider vinegar powder and betaine hydrochloride. Both of these ingredients are acidifiers. Start out taking 1 tablet before each meal. Gradually add an additional tablet per meal each day until you get symptom relief. Some people need more acid and require up to 5 tablets before each meal. But an average person needs between 2-3 per meal. If you feel heart burning or too much acid back off and reduce the amount. The only contra-indication is if you have an ulcer. WHY YOU NEED MORE STOMACH ACID! Did you know there’s a reason why you start to have more digestive problems as you age? It’s called hydrochloric acid. Also known as stomach acid. It’s one of the most overlooked yet important fluids in your body. And as you age, you have less and less of it. As a result the cascade of effects from too little stomach acid can be HUGE. Your pancreas may not release pepsin, the enzyme that breaks down protein. And you’ll start to feel the effects including gas and bloating. The valve at the top of your stomach may not close, which leads to occasional acid reflux and heartburn. Your liver may not release bile for healthy fat digestion. Your body may not be able to absorb essential vitamins and minerals including calcium, iron, zinc and B12. If vitamin B12 is not absorbed, it can result in a deficiency that causes irreversible damage in the nervous system. Your gut health and immunity may be compromised. Further problems from a lack of stomach acid can include shoulder tension, skin irritation, hormone issues, constipation and headaches. So insure you’re doing everything you can to support your stomach’s production of acid today with Dr. Berg’s Apple Cider Vinegar Plus!